In past encounters, I found House of Marley headphones to cut a fine balance between style, sonic experience, feel good factor, and price. Let’s find out if the Liberate on-ear model fits into the same mold. Like all House of Marley products, the Liberate on-ear headphones come in a box made of eco-friendly materials. Inside it, you will find the headset, a carrying pouch made of organic cotton, and a couple of booklets. The headphones do not need any additional accessories. You are fully covered out of the box. The looks of the House of Marley Liberate on-ear headphones are dominated by the wood, fabric, and stainless steel used in their making. Combined, the varying textures make the headset look like part fashion accessory and part audio product. There are three available color schemes for the headphones – black like the unit we tested, denim, and gray/brown. 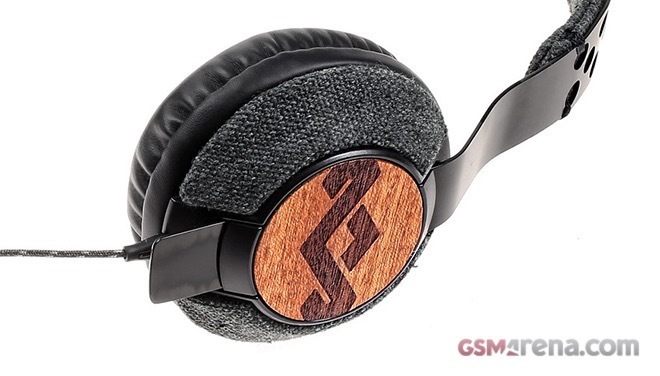 Large House of Marley logos on the sides of the headset leave little doubt about its brand affiliation. Build quality is stellar. The Liberate on-ear headphones are put together from quality, eco-friendly materials and come with a solid two-year warranty. The cable is covered in fabric, while its L-shaped 3.5mm audio connector is made from quality polycarbonate. Overall, the headset is capable of easily handling daily wear and tear. The footprint of the House of Marley Liberate on-ear headphones is small. Combined with the headset’s low weight (177 grams) and well-cushioned ear cups, the compact size makes it a convenient solution of both desktop and on the go usage. At 52 inches of length, the tangle-free cable of the headphones is sufficiently long for regular use. The three-button remote is iOS-friendly and easy to operate. Only the play/pause button works with Android devices. Technical specs of the House of Marley Liberate on-ear headphones include 40mm neodymium audio drivers, whose impedance and sensitivity are 32Ohms and 106dB respectively. Frequency response ranges between 15Hz and 21KHz. House of Marley promises to deliver its signature sound with the Liberate on-ear headphones. In real life, the sonic experience delivered by the headset is dominated by warm, natural bass. The low range defines the entire sound signature of the headphones and might not fit all tastes, especially if your music ventures don’t include bass-heavy tunes. That said, there’s still plenty to enjoy in the high and the mid-range that the Liberate on-ear headphones produce, so long as you set your expectations accordingly. After all, these headphones are not meant for studio monitor duties. Audio quality of the phone calls is good. There’s nothing to frown at on this instance. The Liberate on-ear headphones by House of Marley cut a fine balance between looks and capability. The headset is a good proposition for users who are looking for a stylish solution to match their on the go lifestyle and like bass-heavy sound. House of Marley is asking $99.99 for the Liberate on-ear headphones – an over-ear configuration is available for $149.99. A quick search on Amazon reveals the headset available for a tad over $60, thus making it worth a hard look.